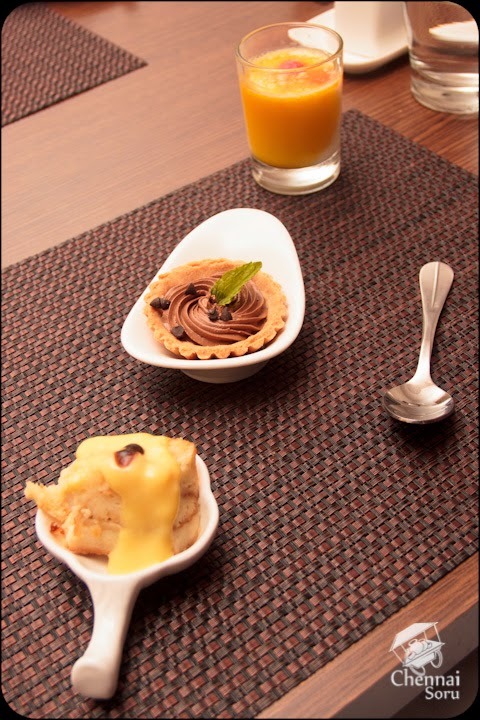 Bistros in Chennai have become the latest trend. One of the recent entrants to this scene is L'Amandier - The Bistro. It has been open for a couple of months now and I have been constantly hearing rave reviews. While taking a stroll down the road on a Sunday one would find it jam packed. This weekend I braved the crowd and entered the joint. I must thank my friend who had made the reservations or I would have been the person waiting outside for a table. From the moment I entered the restaurant it looked and felt as the most happening place in the city. From old grand parents to foreigners, everyone seemed to be here. I was here for the Sunday brunch, and this is the one which most people had raved about. I am not much of a soup person so gave that a pass. Salads looked really tempting, so grabbed a plate and took a bit of the fresh cut veggies and also tired the pasta salads. My favourite of them all was the Chicken Salad. Maybe I am a little biased as I am a Non-veggie, but I loved it the best. After a short stint with the salads I quickly headed to the main course. I skipped the steamed rice and the two veggie sides. The non-veg sides looked really appetising. 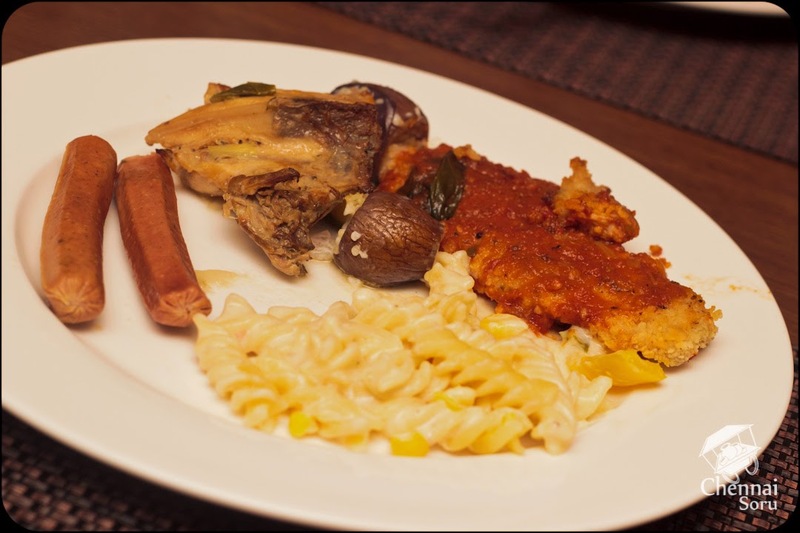 I severed myself the Creamy Fusilli Pasta with Corn, Stuffed Aubergines, Chicken Sausages, Grilled Herbed Chicken and finally the Grilled Fillet of Fish with Marinade sauce. The dishes which I had served myself ticks all the boxes. They were absolutely delicious. No knit picking here. Of the lot I loved the grilled fish the best. Fish felt reasonably fresh in a non-fishing season. Finally headed to the desserts, I grabbed the Vanilla Panna cotta, Chocolate Tart and Custard Cake. The desserts were decent. They also had some freshly cut fruits which I skipped. On the whole the food here is really good. The decor looks nice, but I found the restaurant bit crowded because of the buffet. Will surely visit some other time and enjoy their dining space. The service was reasonable with water being refilled and empty plates taken away. Here comes the best part. The meal was priced at Rs 400/- person which I think is the best bit. A VFM! 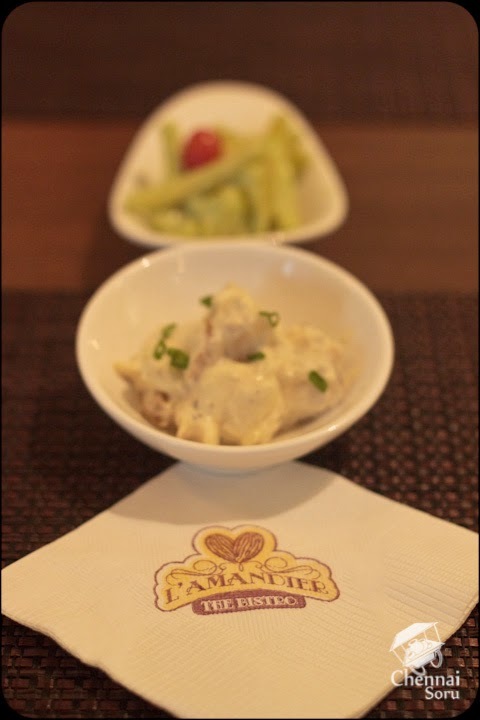 L'Amandier - The Bistro is located in RA Puram right next to Cream Center.